Usen (Yusen) Building, Marunouchi, c. 1930. “The Nippon Yusen Kaisha building will cover an area of 296 by 166 feet and will be of the same height and the same type of construction as that of the Japan Oil Company. It will be completed on or about November 1, 1922. The base course of the building will be of granite and the entire street facades faced with ornamental terra cotta. Nine elevators are to be installed. In addition to its finish and other features the building, since it is to house the offices of the company [NYK], will contain a large assembly hall and a large dining hall with accompanying up-to-date kitchen equipment. 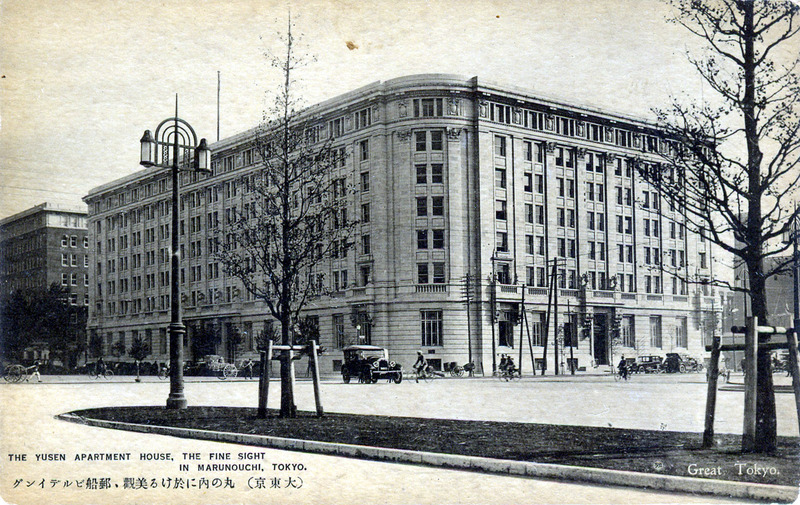 Yusen Building, Marunouchi, c. 1930. “The building allocated to us with Allied Translation and Interpreter Service [and the Counter-Intelligence Service (G-2)] was the NYK Building. On floors one to three of this building, which had one floor underground and seven floors above ground, were the ATIS offices. The fourth floor was used for the officers’ billet, and the fifth to the seventh floors for the non-commissioned officers’ billets. 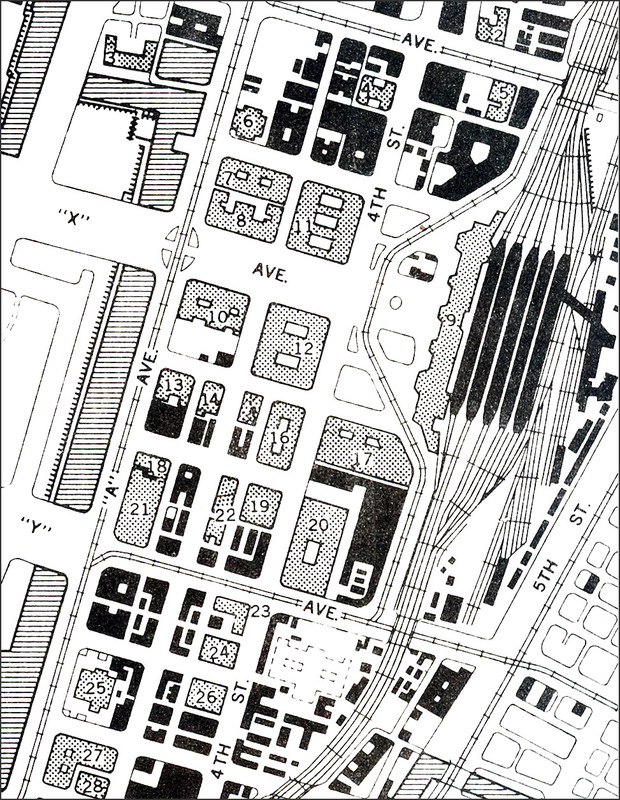 Only the basement was permitted to be used [during the Occupation] by the owners, NYK. 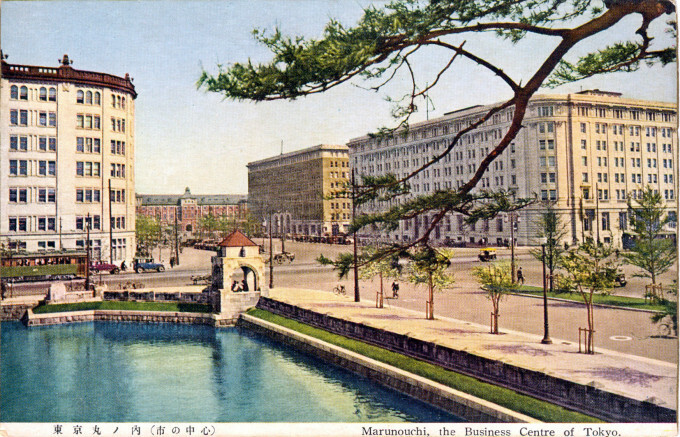 Tokyo Central Station (#9) and the Marunouchi business district, c. 1952. 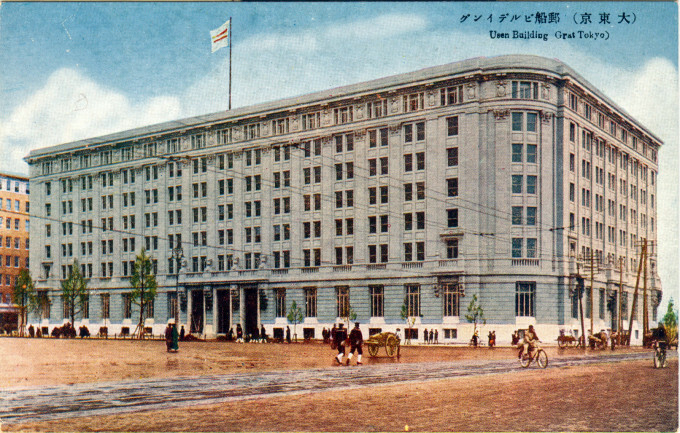 The Yusen (NYK) Building is marked as #10 on the map; #8 is the Kaijo (Marine Insurance) building; #12 is the Marunouchi building. From the wiki: “Nippon Yusen Kaisha traces its history back to the Tsukumo Shokai Shipping company founded by the Tosa clan in 1870. In 1875, as the renamed Mitsubishi Shokai, the company inaugurated Japan’s first passenger liner service, with a route from Yokohama to Shanghai; and in that same year, the company name was changed to Mitsubishi Mail Steamship Company. In 1885, a merger with Kyodo Unyu Kaisha (founded 1882) led to the adoption of the company’s present name. “The merged company had a fleet of 58 steamships and expanded its operations rapidly, first to other ports of the East and then worldwide. Japan’s first long-distance liner service began in 1893 on Bombay route, with a line service to London being inaugurated in 1899. In 1929, distinctive twin red stripes on white background becomes the official funnel mark for NYK vessels. The same year, NYK introduced its first passenger motor ships in 1929 but continued to buy a mixture of steam and motor passenger ships until 1939. “The NYK fleet expanded in bursts, responding to changed economic conditions and perceived changes in the market for passenger liner travel. Amongst the many ships in the early NYK fleet, some names comprise serial categories. Some ships were named after Shinto shrines, and others were named after ancient provinces of Japan, cities of Japan, mountains of Japan or islands of Japan. Some ships had explicitly non-Japanese names, such as ships named after cities. Left to right: Kaijo Building, Tokyo Station, Marunouchi Building, Yusen Building, c. 1930.